The Scanlons, Fitzpatricks, and Quinns represent a segment of American society in the latter half of the 19th century and their interaction with friends, neighbors, and others broadens our view regarding what was happening throughout most of the United States. In Beyond the Divide, J.P. Kenna portrays the effects of major events on the everyday lives of people from the point of view of a New Jersey Irish family. From the reconstruction and post-Civil War growth of industry to the social issues facing the poor, women, unappreciated working men, unmarried mothers, African-Americans, and many more groups, the Scanlon family weathers the changes. Their conversations and letters provide a rich depiction of their lives. From the heyday of the family patriarch, the Irish immigrant James Fitzpatrick, to the adventures in the expansion of the west experienced by his grandson, the growth of the labor movement and the role of politics, religion and money in the events that have shaped the course of this country are creatively, informatively and engagingly presented. 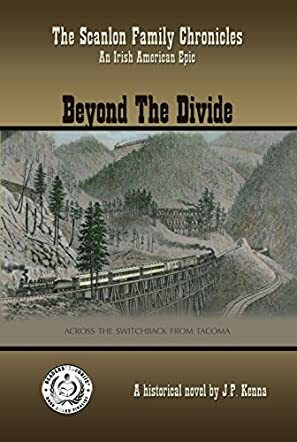 J.P. Kenna has created an engrossing history lesson through excellent story-telling and well-developed characters in Beyond the Divide. Painting clear pictures of life in urban New Jersey as well as the nearly virgin Northwest through the lives of varied yet highly believable characters, Kenna sets the action of his story against the major movements and players of the second half of the 19th century. Kenna creates the basis of social commentary regarding the rise of the vastly wealthy industrialists in contrast to the lives of the working man and farmer. He outlines how government, religion and natural human prejudices were bent to influence the outcome of elections, the course of social policies and the overall future of the American people. This is an excellent novel that deserves a careful reading and deep contemplation.